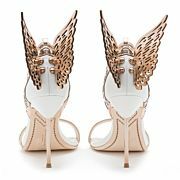 Stunning white leather sandal finished with rose gold straps and laser cut Angel Wing detail. 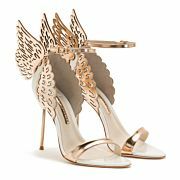 This romantic style will turn heads on a night out or on your wedding day. 60% Calf Leather, 40% Metallic Calf Leather Upper, 100% Calf Leather Sole. Please note this style does not have a screen-printed sole.